"Defeated, Agatha returned home and sat alone that night at the dinner table. The scene of that morning's confrontation replayed itself in an endless loop, always ending with the same bitter threat. Desperate, yet hardly without resources or the determination to save her marriage, she began to craft a plan worthy of any Agatha Christie mystery. The plot was subtle, yet obvious enough for those who knew where to look for clues. Only the ending was left to fate.... Hugging her dog for luck, she picked up her valise and, without looking back, left the security of the house and the only world she knew." In Duchess of Death, Hack tackles one of the most formidable biographies in all of detective, mystery, and crime fiction, that of its greatest author Agatha Christie. Having previously authored best-selling books on historical figures Howard Hughes, J. Edgar Hoover, Ted Turner and Rupert Murdoch, and Margaret Jackson, Hack is undoubtedly aware of the high risk in portraying the private life of such a beloved literary figure. Hack's unauthorized biography of begins with a prologue as deftly written as the greatest climactic scenes in Christie's mystery novels. In part this may be due to the fact that it features the greatest mystery of Christie's own life, the one she crafted herself and rarely spoke of later--her eleven day disappearance following the news that her husband wanted a divorce. Agatha Christie's disappearance capture the attention of Britain and the world at large. Why she left, where she went, and how she carried on are questions that any fan of detective and crime fiction will enjoy parsing. This engaging, page-turning introduction to the life of the greatest mystery writer of all time whets readers' appetites and spurs them onto Chapter One in which Hack backtracks to the beginning of Christie's life and from there proceeds chronologically. Hack's text and research is based upon Christie's own biography and non-fiction publications (Agatha Christie: An Autobiography, Come, Tell Me How You Live, and The Grand Tour: Around the World with the Queen of Mystery) as well as letters, notes, and other documents the writer and those closest to her left behind. In using these clues, Hack pieces together the fullest representation of the life of the world's best-selling mystery author. For those both familiar and unfamiliar with Agatha Christie's biography, the text is truly fascinating. Christie loved foreign travel, swimming, her dogs, the company of actors, and spending her time in sand dunes in the Middle East while on archaeological digs with her second husband. She detested interviews, the limelight, and watching the majority of the adaptations of her work on the stage and screen. Many fans might be aware that beyond her iconic status as a writer, Christie is an intriguing feminist figure--committed to writing as a source of income and yet admittedly in need of the love, companionship, and support of a marriage partner. Hack details Christie's life, incorporating her own words wherever possible, while interweaving her publication history. Finding out which of Christie's novels were her favorite and least favorite while learning what was happening in her personal life during their publication is both insightful and intriguing. Though there are a few plot spoilers here and there while Hack accounts for Christie's many publications featuring famed detectives Hercule Poirot, Miss Marple, Tommy and Tuppence, and others, the majority of the major clues and whodunnits are kept under wraps so as not to discourage readers just beginning their discovery of Christie's body of work to continue reading. 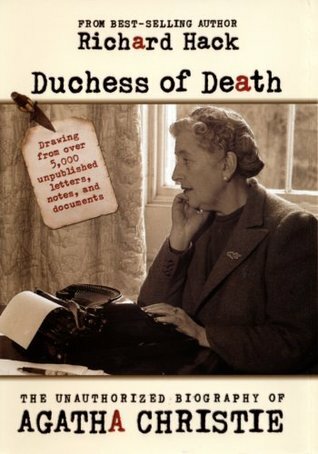 Duchess of Death is a great read for anyone interested in mystery, crime, or detective fiction, or those who can appreciate a finely crafted biography of one of literature's most famous writers. A kindred spirit! How did you like reading "Come Tell Me How You Live"? Would you recommend it?